An Italian shipwreck located off the coast of Genoa is believed to be 2,000 years-old, and, if that wasn’t enough, is believed to contain hundreds of intact amphorae, or clay jugs, containing oil, grain, olives, wine and other staples of Roman life. The Italian shipwreck was discovered between 60-70 meters under the sea off the coast of the port city of Genoa. The investigation that culminated in the ship’s discovery was sparked by reports that local fishermen were catching pottery shards and other tools in their nets. The shipwreck was found by an underwater rover and despite its upper section being nearly destroyed, the lower portion of the wreck site appears “remarkably well-preserved,” according to a BBC report. Only one intact amphora has been recovered, but based on what divers have seen, several hundred may remain not only intact, but sealed. Sealed amphorae would allow scientists and researchers to analyze and study the cargo that was being shipped and would provide a glimpse into Roman trade during the first century BC and the second century AD. Genoa, located on the northwestern coast of Italy, was destroyed by Carthaginian general Hannibal Barca during the Second Punic War (218-202 BC), but by the Medieval Era was a maritime port rivaling Venice or Pisa. 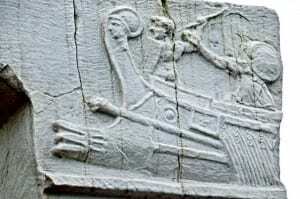 The ship, a navis oneraria, or merchant vessel, is likely to have been named after a Roman god or mythical hero, though researchers have yet to determine the name it was given. “The peculiarity of this is that the wreck could be almost intact,” Lt. Col. Francesco Schilardi of the police divers group told the BBC. The wreck is thought to be one of the best preserved shipwrecks ever discovered. “We believe it dates to sometime between the 1st Century BC and the 1st Century AD,” Lt. Col. Schilardi added. “There are some broken jars around the wreck, but we believe that most of the amphorae inside the ship are still sealed and food filled,” Lt. Col. Schilardi continued. The ship is buried under layers of mud, which is believed to have contributed to its remarkably well-preserved state. Italian authorities will let the shipwreck remain on the seafloor until they decide whether to raise it to the surface or not. Police have erected an exclusion zone around the wreck in order to protect it from vandals and other divers. Video of the shipwreck can be found here – Credit to the International Business Times and BBC.